Let John Piper take you into the lives and times of Augustine, Luther, and Calvin - great men of God who overcame adversity and weakness to abide in God's enduring grace. Piper's vivid account will inspire you with a passion for God's glory. 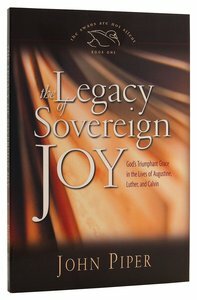 About "The Legacy of Sovereign Joy (#01 in Swans Are Not Silent Series)"
Renowned preacher John Piper takes a close and inspirational look at the lives of twenty-one historic Christian leaders, highlighting their perseverance, courage, and joy. Biographies of Athanasius, John Owen, and J. Gresham Machen. In the life of each, personal holiness was emphasized publicly and privately, despite hardship and suffering. Fourth volume of The Swans Are Not Silent series. John Piper gives us biographies of Athanasius, John Owen, and J. Gresham Machen - bishop, pastor, and seminary founder. In the life of each individual, personal holiness was emphasized publicly and privately, despite hardship and suffering. They contended for Jesus Christ, our all, and they remain examples for us today. Fourth volume of The Swans Are Not Silent series.